A while ago I decided to finally show off my gear bag. It's a Lowepro sling, and I use it for travel and casual vacation photography, although most of the stuff in it has moved to a different bag (more on that later). 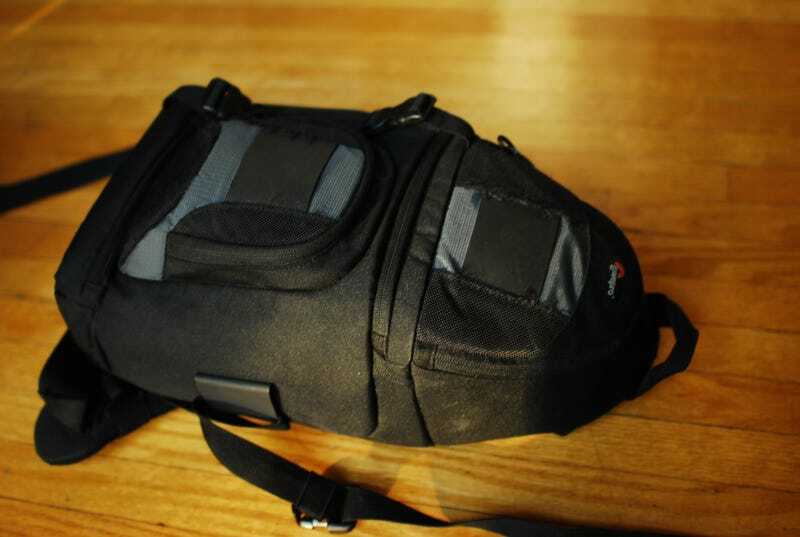 Here's the sling bag itself. Here's the inside, sans camera. If I took out my X100 to do this shot it would be blurry as heck. My 50mm is quietly nestled in their, most of the time I only rock about one or two lenses in the bag, and leave the rest at home. Sheet's a volunteer hours list thing. There's a microfiber towel somewhere in the flap. Here's one of the pockets, with some batteries, some body caps and another microfiber towel. Finally in this bag is an unused light meter (apparently the batteries are so old they were last made in W. Germany), a air bulb blower thing, and what I'm assuming is a stand for something. I'll just leave this shot of my tripod here. I need another shoe for the thing. I'll show off my new/old bag in another post, thanks!